The Master of Science in Clinical Nutrition program is available on a part-time or full-time basis. This program is ideally suited for part-time study so that you may continue to work. Part-time students usually complete the program in three to five years. Full-time study usually requires 18 months. Whether a full- or part-time student, you must complete the required 36 credits within five years of matriculation. You may be able to transfer credit hours of applicable graduate credit from another accredited university. To transfer credits, you must receive a “B” grade or better for the course and get approval from your supervisory committee. Research is an integral part of the nutrition master’s degree program. You will have the opportunity to complete a research thesis, but it is not required. Please note that obtaining the clinical nutrition MS degree only does not qualify you to sit for the RD exam. What is a Master of Science in Clinical Nutrition? A master’s degree in clinical nutrition (M.S. in Clinical Nutrition) prepares students for careers in federal or state agencies, public health or wellness settings, private industry, research or academic settings. The clinical nutrition program curriculum combines theoretical knowledge and evidence-based research with practical clinical applications. Students enhance their ability to critically think in order to take on all challenges in the field of clinical nutrition. Additionally, students learn to design, implement and present research thereby enhancing their ability to gather, assess and critically analyze data. The term “nutritionist” is often synonymous with the term “dietitian;” however, there are important differences. Individuals calling themselves nutritionists may have no professional training or may have a PhD. The term is not protected unless they go through certification to become a certified nutrition specialist, or CNS. While nutritionists require varying levels of education, dietitians must complete specific nutrition-related coursework from an Accreditation Council for Education in Nutrition and Dietetics-accredited institution and fulfill 1,200 hours of supervised practice via an ACEND-accredited dietetic internship. Dietitians must pass a national registration exam from the Commission on Dietetic Registration, or CDR, in order to practice as a registered dietitian nutritionist, or RDN. A Master of Science in Clinical Nutrition prepares students to pursue advanced career opportunities in specialty areas such as nutrition support, pediatrics and renal nutrition. A Master of Science in Clinical Nutrition degree also provides students with a strong foundation in theoretical and practical knowledge from coursework in the areas of nutrition and dietetics. The program allows students to specialize in a wide variety of areas with most graduates focusing their career on specific interests and specialty areas in the field of clinical nutrition, as well as enhancing their ability to be successful professionals in specialized or general areas in the field. An individual obtaining a MS in Clinical Nutrition can expect to work in a variety of careers, such as in federal or state agencies, public health or wellness settings, private industry, research or the academic settings. Students with this degree will also have the option of completing a thesis or non-thesis project, which exposes the student to conducting clinical research. A community nutritionist is an expert in diet and nutrition who works to improve public nutritional habits instead of working one on one with individual clients. Often they develop programs and policies for institutions that improve nutrition, which can include developing meal plans based on needs, cost and culture, evaluating the impact of the program or policy and reporting the results. Nutrition educators work as faculty for universities, colleges and even with government agencies to help develop specific programming. Within this role the nutritionist may develop curriculum, courses or programs while assessing student learning outcomes. Faculty teach courses in a variety of areas ranging from the classroom to a metabolic kitchen or supervised experience setting. Additionally faculty often act as an advisor and mentor to students majoring in the nutrition field and as a faculty advisor to food and nutrition student clubs. Research is an essential component of the nutrition field. Nutritionists working in this setting use their scientific expertise to design, coordinate and implement study protocols. These tasks can include recruiting study participants, implementing nutrition intervention programs, coordinating programs and budgets, maintaining data management software programs, supporting data collection, ensuring quality control of data collection, and creating and updating scheduling systems to ensure proper workflow of study procedures. In the industry setting, nutritionists work with corporate or non-profit organizations within the regulations, product development, communications, marketing or sales departments. In this role, nutritionists have the ability to inform product development, identify and evaluate trends and innovations, guide strategies, and highlight opportunities for product integration, determine whether products comply with regulations to meet health claims, and to effectively communicating news and translate science. According to the Bureau of Labor Statistics, the average annual salary of dietitians and nutritionists is $59,670. Please note that this can vary bases on experience, location and specialty. According to the BLS, employment of nutritionists is projected to grow 15 percent from 2016 to 2026, much faster than the average for all occupations. Graduates have the option of becoming a registered dietitian nutritionist by applying to a dietetics program accredited by ACEND to complete required coursework and receive a verification statement. Upon receiving a verification statement, students can apply to an ACEND-accredited supervised practice dietetic internship and complete the 1,200 required practice hours. Completing these two steps will allow the student to be eligible to take the Commission on Dietetic Registration’s registration exam. Alternatively students can complete 900 hours of a supervised internship in the field to become eligible to take the certification of nutrition specialists exam and obtain the title of certified nutrition specialist. Why Rush University for your MS in Clinical Nutrition? 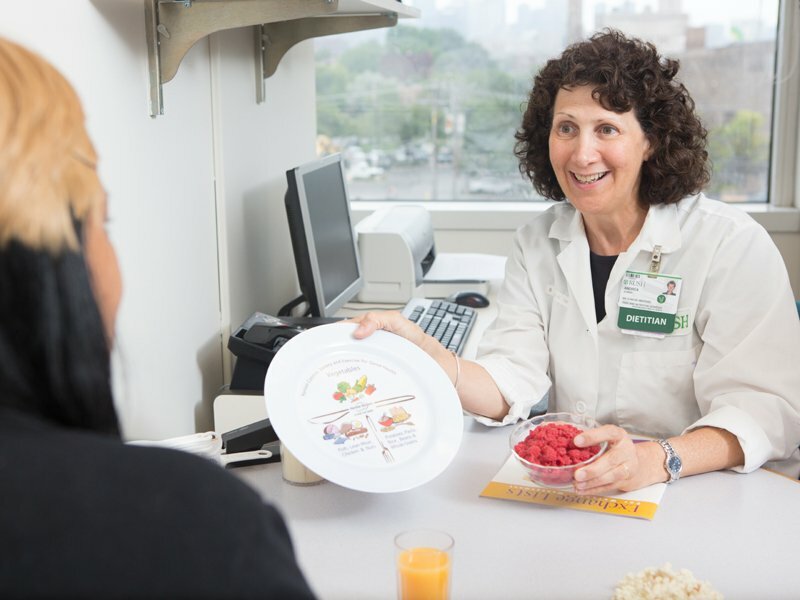 The Department of Clinical Nutrition at Rush University is recognized nationally and within the Chicagoland area for its expertise in the field of clinical nutrition. Because the program is housed in and affiliated with an academic medical center, it has the advantage of coordinating experiences in specialty areas that many other academic degree-granting programs cannot provide. Within the program, students work closely with respected faculty to effectively design and execute research projects, assess and interpret findings, and promote health and well-being to the communities they serve. Students have the opportunity to pursue research in numerous specialized areas, including neurology, oncology, obesity, body composition, nutrition assessment, critical care and pediatric nutrition. Faculty and instructors have been invited speakers to present their research at local, national and international conferences and are published in peer reviewed journals. Learn more about the Master of Science in Clinical Nutrition program at an on-campus or online information session.